Chromogenic horseradish peroxidase (HRP) substrate for Western blot and tissue staining methods. DAB (3,3'-diaminobenzidine tetrahydrochloride; MW = 214.1) reacts with HRP in the presence of peroxide to yield an insoluble brown-colored product at locations where peroxidase-conjugated antibodies are bound to samples. 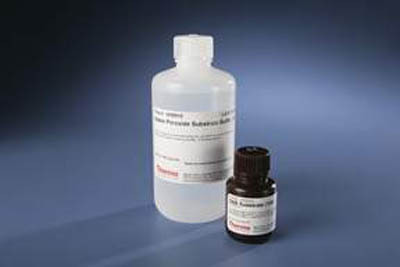 The brown precipitate is insoluble in alcohol and other organic solvents, making it an excellent substrate for immunohistochemical staining that requires the use of traditional counterstains and mounting media. The Pierce DAB Substrate Kit includes a 10X solution of DAB and Stable Peroxide Substrate Buffer. Crystalline DAB (powder) is also available.